After orthopedic surgery, many people need mobility aids like a rollator. When compared to other mobility tools, a rollator offers the ability for people to step with a walking gait that is more natural. For example, individuals who must use crutches or a standard walker cannot do sharp turns or change directions quickly. Not only can a rollator gives back a sense of autonomy for users, but outdoor rollators are robust mobility aids that are designed to withstand extended use as well as ensure movement on different surfaces. Outdoor rollators are medical devices for those who are independent enough to move about but may need stability when outdoors. They are designed with a platform, allowing those with degenerative muscular diseases to sit and relax. They are the ideal solution to those who want to sit at a park, or simply take a seat when tired. Compared to a traditional rollator, an outdoor rollator will have a basket fixture, allowing you to take your groceries with you. Outdoor rollators, when compared to standard rollators, are designed to be more robust. Sometimes this robustness translates into the weight of the rollator, with the rollator being heavy due to attached features or thicker metal used in the construction of the device. 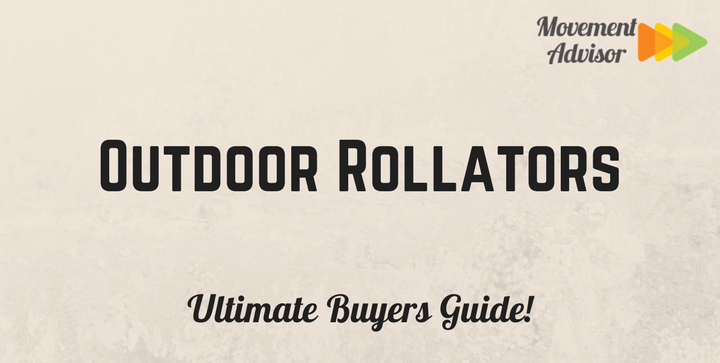 There are several options available when it comes to selecting an outdoor rollator. You want one made with all the features that you expect, including a bag holder, ergonomically designed handles, and wheels large enough so that the device can glide over grass, unpaved roads, and other surfaces that may be a bit rough on your rollator. The Hugo Mobility rollator is one of the more lighter rollators, as it only weighs 15.4 pounds, several pounds less than other rollators of similar size. It has a side folding mechanism, allowing it to conveniently fold via the pull of the strap near the seat, making it a rollator that may have advanced features, but is still manageable and easy to operate. As expected from Hugo Mobility, this rollator has a padded seating platform built into the frame, with a contoured backrest for more security. The backrest is one of the more underrated features of a rollator. For people who have a difficult time of keeping themselves upright for an extended period without feeling exhausted, the backrest will give you the confidence that you need. Hugo Mobility rectifies the problem with a padded backrest and hand brakes that will lock themselves when you’re sitting down. There is no additional assembly required when it is folded and when reopened. The Hugo Mobility rollator can accommodate up to 300 pounds and is designed to be well-suited for those who are recovering from an injury or as part of physical therapy. Will fit most people between 5″ and 6’2″. TrustCare Let’s Go Rollator looks a bit different than your traditional Rollator. It has a steel X frame that folds into itself, with accommodating wheels that allow it to be nimble even if used on a patch of compacted dirt. An elegant rollator, TrustCare Let’s Go Rollator comes with a bag so you can carry your personal belongings, with a water resistant, leather seat that stays comfortable for years to come. Its large wheels enable it to roll over small cracks in the pavement, without the rollator dragging itself across the ground. The bigger wheels also let the rollator to quickly move on terrain that isn’t so flat, like a patch of grass that you may come across if visiting a local park. A convenient spring system gives the rollator a smooth feel when in use. Like a bike, the large wheels allow the device to climb onto the curb quickly. TrustCare Let’s Go Rollator has comfortable handles that are adjustable from 78 to 96 cm. This generous adjustment allows the rollator to be compatible with men and women of different height. TrustCare Let’s Go Rollator can accommodate 130 kg or 286 lbs. Large wheels accommodate different terrain as well as absorb impact. An aluminum-based construction allows the Volaris All-terrain Rollator to be extraordinarily light yet sturdy, accommodating up to 332 pounds. It is an all-terrain walker, which is designed to be nimble but able to withstand different surfaces. The all-terrain device has large 8-inch wheels that will give those who are venturing out, confidence to do so. The tires on the Volaris All-terrain Rollator are cushioned, allowing the device to absorb the small cracks and bumps in the pavement without you even realizing it. It follows the popular X-type design that allows the rollator to quickly fold onto itself for easy storage, with a flexible frame that flexes with your movement while still offering stability. The Volaris All-terrain Rollator is best for those who live in an area with unpaved roads and who may be quick to tire if forced to maneuver a heavier rollator. Not only that, but the compact design of the Volaris All-terrain Rollator makes it versatile, finding its place indoors as well. The ergonomic design of this rollator gives you the ability to stand upright with good posture while walking, not hunched over like other types of rollators. The Volaris company stands behind their product, with accessories to help you get the most out of your rollator. Larger wheels allow it to accommodate different surfaces. Aluminum is significantly more lightweight than other types of metals used in these mobility aids. The Trionic Trek Mountain All-Terrain Rollator has several bags and compartments, allowing you to carry your personal belongings with you during your excursions. It’s a versatile seat bag and backpack is fastened onto the steel chassis of the rollator, with quick release tires allowing the mobility device to take a more compact form for storage and utility. The bags snap onto place. Within the pockets, three separate compartments provide room for maps, cell phones, and a camera. The Trionic Trek Mountain rollator emphasizes the importance of practicality, with the seat bag quickly being removed and used as a shoulder bag with a detachable strap. Not only is the rollator robust with all-terrain features but it also emphasizes the significance of nighttime safety, with reflective compartments and linings to make you visible to traffic during low visibility situations. The three-wheeled Lumex Sure-Gait rollator may look a bit more fragile than the other rollator, but it is a robust mobility aid that can withstand up to 300 pounds. Even though it may not be all aluminum like other premium rollators, this 3-wheel walker has chrome plated steel frame that allows it to fold on itself for easy storage and mobility. The Lumex Sure-Gait rollator is preferred for those who are sure of their abilities of movement, and who may just require a bit of help when traveling certain distances or on different types of terrain. Outdoor rollators can help you venture outside of your home after surgery or an operation. The design of these mobility aids will help absorb the cracks and depressions on the ground. Rollators make it easier to move around, with many preferring it over crutches, wheelchairs, and other mobility tools.